CHARLOTTE, N.C. – Charlotte-Mecklenburg police arrested a Panthers fan accused of sucker-punching an older fan Thursday night in the upper deck of Bank of America stadium during the Panthers versus Eagles game. 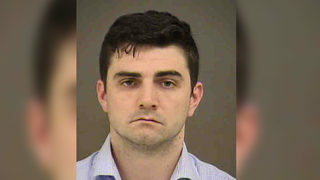 Kyle Adam Maraghy is charged with simple assault and was at the Mecklenburg County jail. He was later released but did not answer any of Channel 9’s questions. Channel 9 looked into Maraghy’s past and found he was charged with assault in 2013 but those charges were dropped. Channel 9 reporter Tina Terry spoke to the person who shot the video, who told her that Maraghy was standing during much of the game. People behind him became agitated and they started to argue. Eventually, the video shows Maraghy turning around and punching the man sitting behind him in the face. In the video, the man who was punched begins bleeding and remains seated while the suspect continues to punch him repeatedly. In the video, several other fans try to break up the incident before the attacker and a woman quickly leave. As the video spread across social media Friday morning, people were calling for the man to be caught and charges to be filed. The victim was treated at the stadium and released.